% x 8 x 32 in. 'Vi x 7 x 10 in. 3/4 x 5 x 28^ in. PHOTO B: Fasten the coatrack ends to the back with glue and flathead wood screws driven into counterbored pilot hoies. Ciamp the parts together first to hold them securely whlie you install the screws. 0 Enlarge the End Layout grid drawing, page 16fi, to form a full-size paper or cardboard pattern of the coatrack end profile. Cut out the pattern and use it as a template for drawing profiles on both coatrack end workpieces (See Photo A). 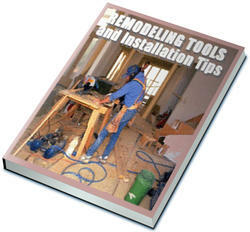 0Cut the bark profile using a jig saw or circular saw. Make these straight cuts with your saw guided against a straightedge. 0 Cut the coatrack ends to shape: Clamp each end to your worksurface, providing sufficient clear-space beneath the workpiece for the saw blade. 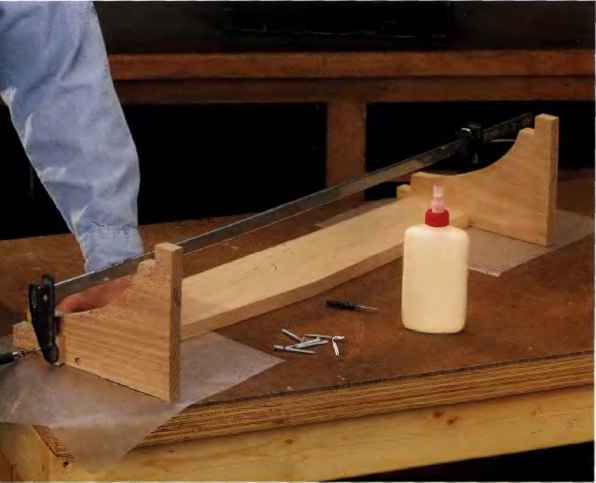 Install a narrow, fine-toothed blade in your jig saw and cut out the end profiles. Tip: If your jig saw has various settings for adjusting blade orbit, set the saw for no orbiting action to minimize tearout while you cut. 0 Fasten the coatrack ends to the back: Arrange the parts so the back will be flush with the long edges of the ends and inset 1 in. up from the bottoms of the ends. The profiled edge of the back should face up. Drill two counterbored pilot holes through each coatrack end and into the ends of the back panel for scrcws using a bit that bores a %-in.-dia. count whore. Spread glue on the ends of the back panel, set the ends and back together and attach the parts with lVS-in. brass flathead wood screws (See Photo B). PHOTO C: Once you've attached the caatrack parts, cover the sciew-heads with face-grain red oak plugs held In place with glue. Tap each plug Into Its counterbore with a wooden maiiet. PHOTO D: Shave the piugs so they're nearly flush with the surrounding wood surface using a Surform plane or a wood rasp. Sand away the remaining waste with coarse sandpaper. the ends with #<H X 1 W-in. brass f lath cad wood screws. PHOTO E: Brush or wipe on a coat of wood stain with a foam brush or clean rag, then wipe off the excess stain before it dries. Wear disposable groves to protect your hands. Topcoat the project with varnish. 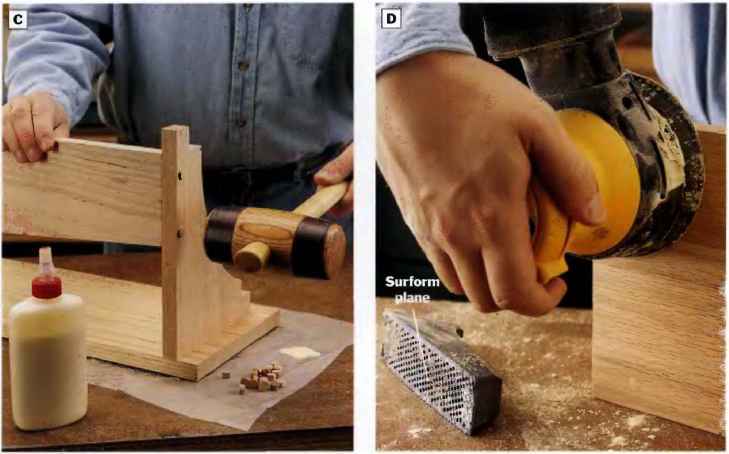 © Squeeze a drop of glue into each screwhead counterbore, and tap in oak wood plugs with a wooden mallet to conceal the screws (See Photo C). © Use a Surform plane or wood rasp and file to trim the wood plugs down until they are nearly ilush with the surrounding wood surface. Sand the plugs flush with 80-grit sandpaper (See Photo D). © Sand all project surfaces with 150-, then 220-grit sandpaper until smooth. Hand-sand the coatrack end profiles as well to remove any saw marks. PHOTO F: Lay out and attach four coat hooks to the coatrack back. Driii piiot hoies for the screws, especially If the screws are made of brass. Space the hooks about 6 in. apart. 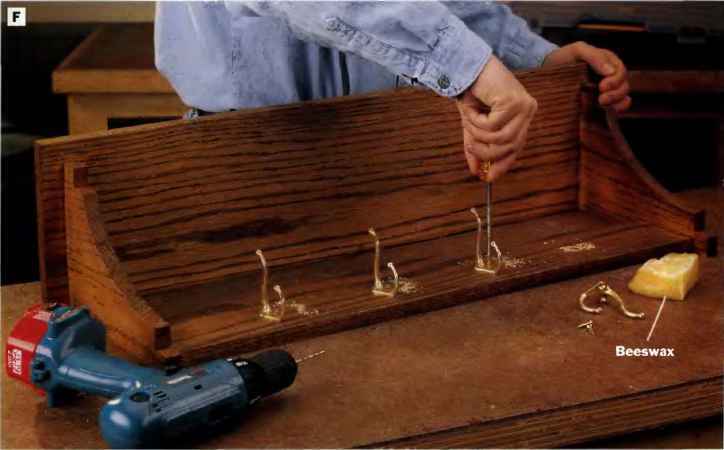 Tip: Coat the screw threads with beeswax to make them easier to drive into the oak. 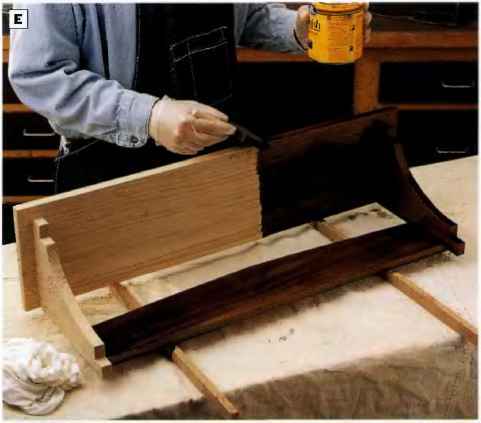 ©Brush or wipe on several coats of wood stain, and wipe off the excess stain before it dries (See Photo E). Protect the project with two coats of varnish. © Lay out and install the coat hooks: Arrange the four hooks so they're spaced about 6 in. apart and centered vertically on the coatrack back. Drill pilot holes for the attachment screws, and fasten the hooks using the screws provided with the hooks (See Photo F). Coat hooks come In a number of configurations, shapes and finishes to suit many project styles and applications. Twin-hook styles, mounted side by side or one on top of the other, are useful for hanging two coats or a coat and hat. You'll want to leave adequate clear space around these double hooks, as we suggest on this coatrack project, so bulky Items can hang freely. Single-hook hardware Is also available, which may be a better choice for mounting in confined areas. Aside from the hook configurations, coat hooks come ¡in a number of different metals Including brass, nickel or silver with poiished, brushed, "antique" or chrome finishes. A variety of reproduction and whimsical coat hook designs also are available. 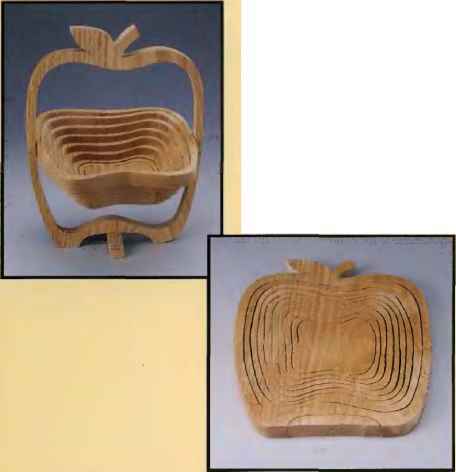 For best selection, thumb through reproduction hardware fcnd woodworking supply catalogs once you've surveyed th6 local home center or hardware*store. 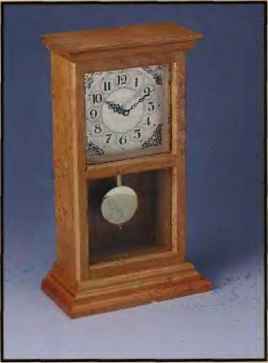 The mantel clock is one of the oldest clock types, sized to fit neatly on a hearth. 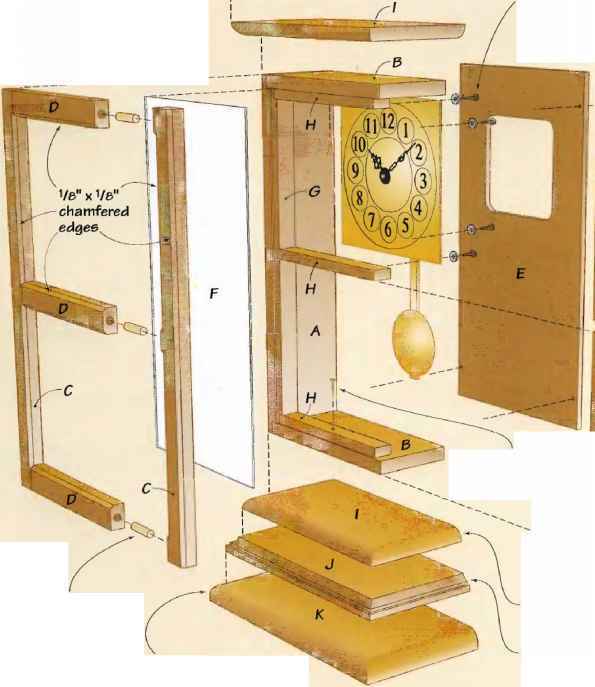 But yon don't need a fireplace for an excuse to build this heirloom-quality project, its compact size will be equally attractive on a bookshelf or side table. 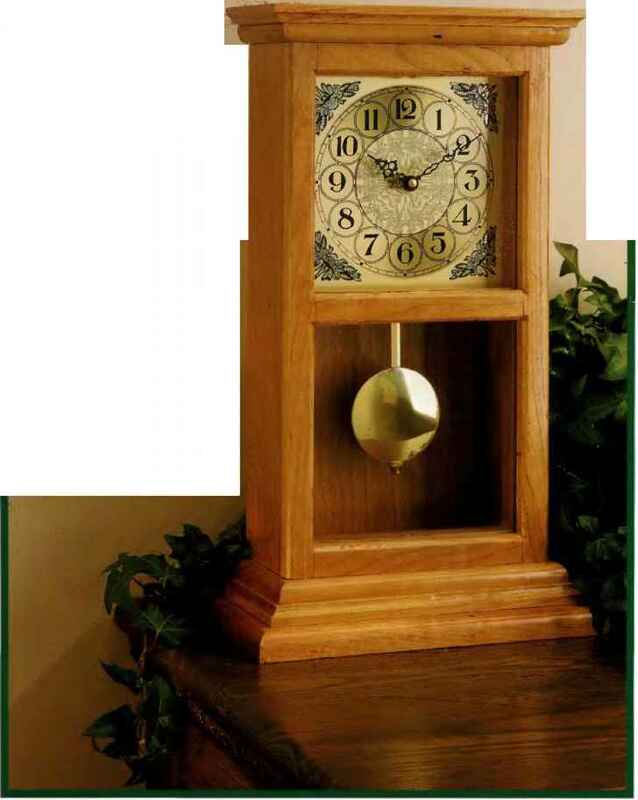 Made of cherry, our design features a split-frame glass panel to highlight the brass pendulum and clock face as well as an elegant crown and base that you can make easily with a router. #4 x W brass wood screws, typ.